When it comes to exercising, or just generally listening to music, a pair of noise cancelling earphones can be hugely beneficial. They allow you to become fully immersed in the music and lose yourself in your surroundings. It’s a fantastic experience, and one that many look forward to during their workout or when they are commuting to and from work. When you go to buy a pair, you look for something that offers an element of style while remaining comfortable. They should fit the ears securely, preferably so they don’t slide out when you are on the go. The sound quality should be decent, with minimal cracking or distortion so that you have an easy listening experience. A level of bass is often a nice touch, as are Bluetooth features that make life a little bit easier. No matter what you are looking for, you will find the best pair of noise cancelling earphones here, even if you’re on a budget. These noise isolating earphones offer quality on a budget. 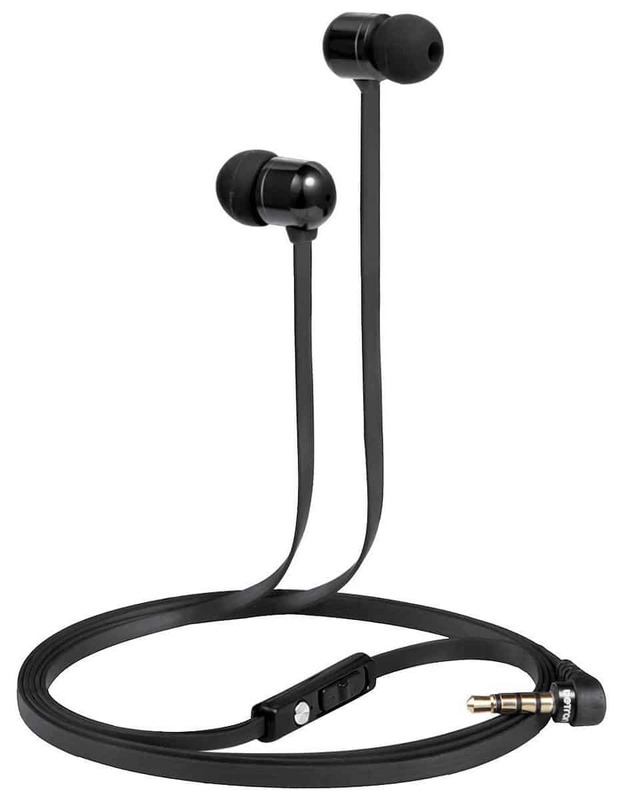 They have a sleek, minimalist design in black and are sure to provide you with an easy listening experience. They have a comfortable fit and are very lightweight, so you will hardly notice them sitting in your ears. They have a heavy, deep, bass for a superior quality, and the sound in general is equally matched. They are high definition with easy volume control and a built in microphone for hands free calling. The cable is tangle free, so you don’t need to worry about finding it in a balled mess. Plus, it can be used with all phones, tablets, and portable game systems. These cheap earphones provide excellent sound quality and a smooth level of bass that is sure to enhance the listening experience. They are lightweight and hardly noticeable in the ears while you are on your way to work, exercising, or just out for a stroll. With a built in microphone and volume control, they are perfect for taking calls without having to stop and fiddle with your phone. Q: How long is the cable please ? A: 1.3m from plug to each earphone head. Q: Do they cut out external noise well? A: Yes the noise isolation is great. These earphones really display the clear definition when it comes to the noise cancelling vs noise isolation debate. With these, you can completely lose yourself in your surroundings and will hear nothing from the outside world. Of course, there are situations when this is not safe, and the awareness mode that has been incorporated will allow you to her your surroundings when required. They are made to work perfectly with Apple devices (Android models are available), and the sound quality is truly spectacular. Lifelike and with a digital quality you would not expect from earphones, they are worth every penny. With convenient control on the wire, and enhanced ear tips for a secure yet comfortable fit, you’ll be wondering why you didn’t get them sooner. If you are looking for a pair of noise cancelling headphones that will keep the outside world our and a superb quality of sound running through your ears, then these are the ones to get. Relatively affordable and with easy controls on the wire, they are simple to use and make life easier when you have to take calls on the go. With Android models available along this Apple one, there is no excuse not to have a pair of these. 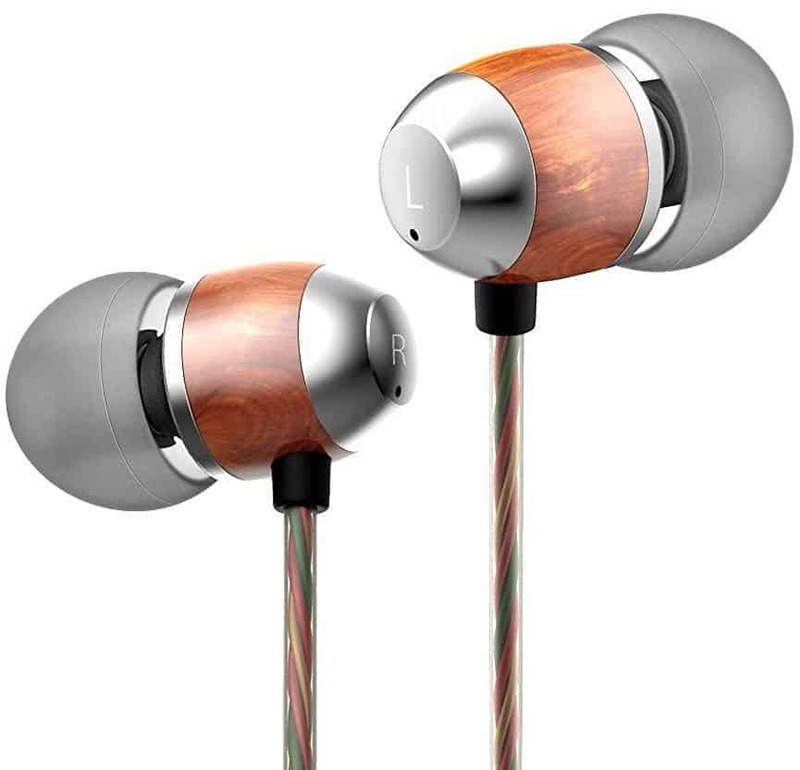 These earphones have a retro style and are brilliantly priced under 50 pounds. They are handcrafted from real wood, which provides you with a crisp sound that is powerful, accompanied by a strong, yet not overpowering, bass. They have an excellent frequency response curve, protecting your ears and providing you with a sublime listening experience. 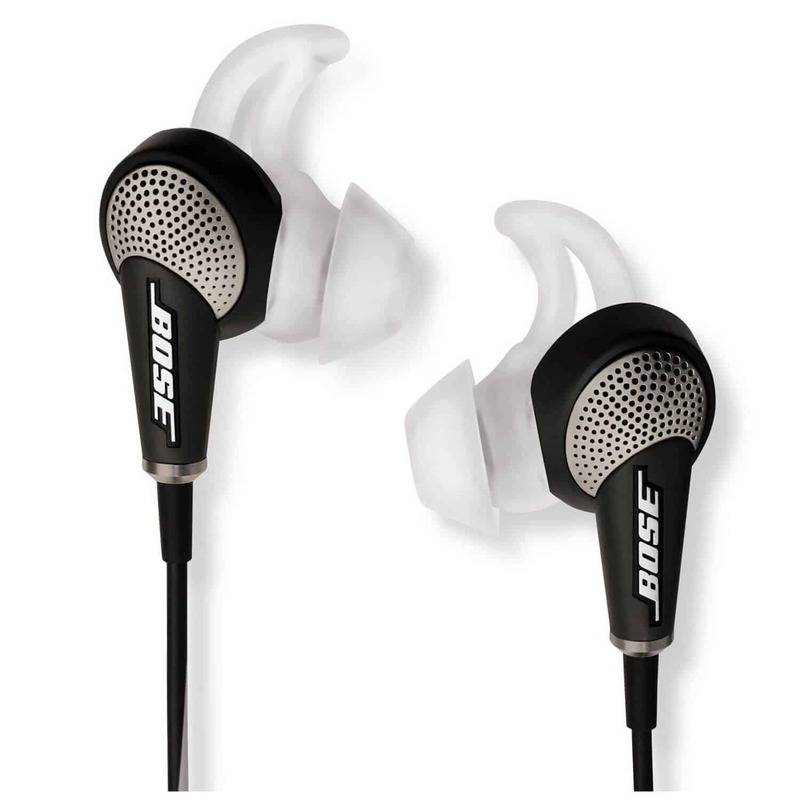 Compact and light, they also provide a comfortable fit that slides nicely into the ear. They have a built in microphone and a button that allows you to take calls quickly when you are on the move. They are compatible with all devices and are sure to leave you feeling good about your purchase. These noise cancelling earphones were made to let you enjoy the music and forget your surroundings, all at an excellent price – especially for the quality they provide. Made from wood and carefully handcrafted, they have a high gloss finish and a retro look that go fantastically with any device that has a headphone jack. A truly superb option if you are looking for something a little different. These nifty earphones have a subtle design and advanced Bluetooth 4.1 technology. The signal is twice as strong, and it can be connected to two devices at one time. So your smartphone can be there for you to pick up calls, and your music player to stream your tubes while you go about your day. Calls, volume control, and track skipping can be controlled with a nifty little box around your neck (included). They eliminate all the noise around you so that you can have complete concentration and privacy. The rechargeable battery lasts 72 hours on standby, and can give you up to 10 hours of battery life when being used for calls, or six for music. All it takes is a three-hour charging period. The reviews for these earphones are generally good, praising the exquisite sound quality and the noise cancelling features. Lightweight and affordable, they are the perfect gym companion earphones, but are also ideal for commuting and general travel. Sweatproof, and with a range of advanced Bluetooth features, you get a lot of bang for your buck with a pair of these. These earphones have active noise cancelling features, so that at the flick of a switch you can tune out low frequency background noise for a more personal and uninterrupted listening experience. It also has a built in microphone and hands free calling integrated into it, so you don’t need to spend time fiddling and potentially lose your concentration. There is no need to charge them either, as they come with a battery powered bank that simply plugs in via micro USB. It’s perfect for long haul flights or hiking trips. Plus, you can even plug your smartphone into it. These earphones are compatible with just about any power bank. Nifty and unique, they are also very comfortable to wear. 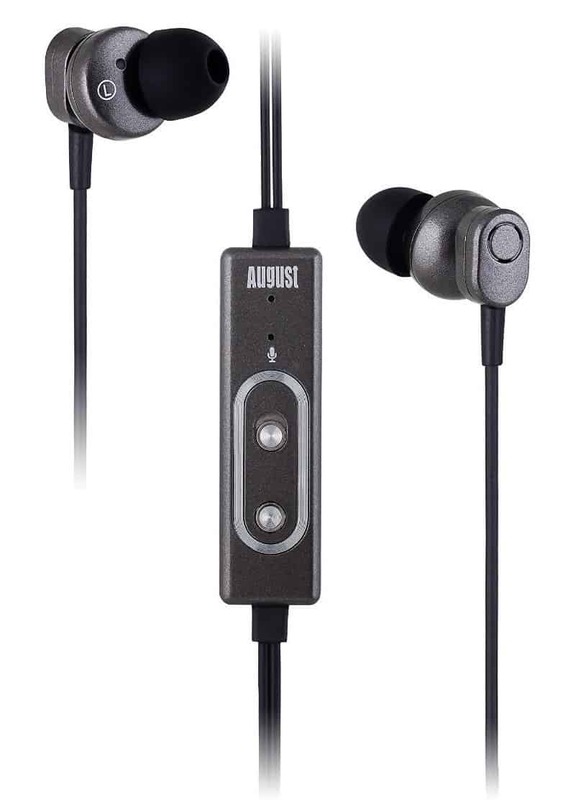 This nifty pair of earphones have had great reviews, prising it for its compact size and lightweight feel. While there are a couple of design flaws, there is no faulting its great noise cancelling features and sublime quality of sound. 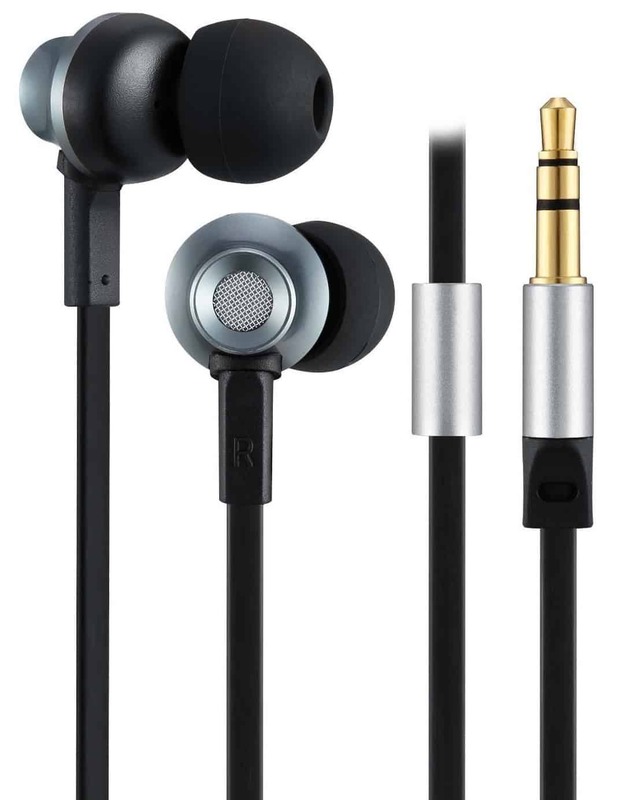 For such a low price, these earphones are ideal for life on the go as well as commuting to and from work. A more private experience, and all at a budget price. Sony have some of the best noise cancelling earphones around, and these are no exception. They have digital noise cancelling that works perfectly with Sony phones – removing all surrounding noise and making your listening experience a more personal one. With these, you get a rich audio sound with full range and a deep bass. The earbuds were designed for further noise isolation, making them even more effective than before. There is also a built in microphone for hands free calling, so you don’t need to worry about fiddling with your phone and pulling your earphones out. Comfortable and good for those on a budget, they are ones you don’t want to miss. 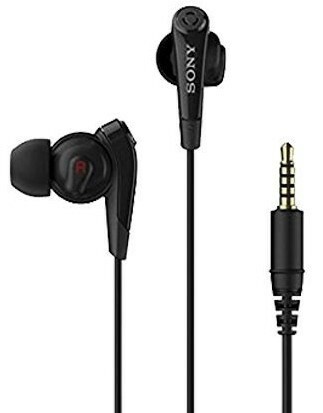 These earphones are great for those looking for a cheap pair to go with their Sony phones. Noise cancelling, and with good sound quality, they do the job better than most other budget earphones. Plus, the fact that they were designed to go with Sony products generally means they will work better with them. They are a great pair to go for, and cheap to replace if they get lost. If you are looking for the best noise cancelling earphones, then you are sure to find them here. With a whole range of models from different brands, there is something to suit every design need and price range. 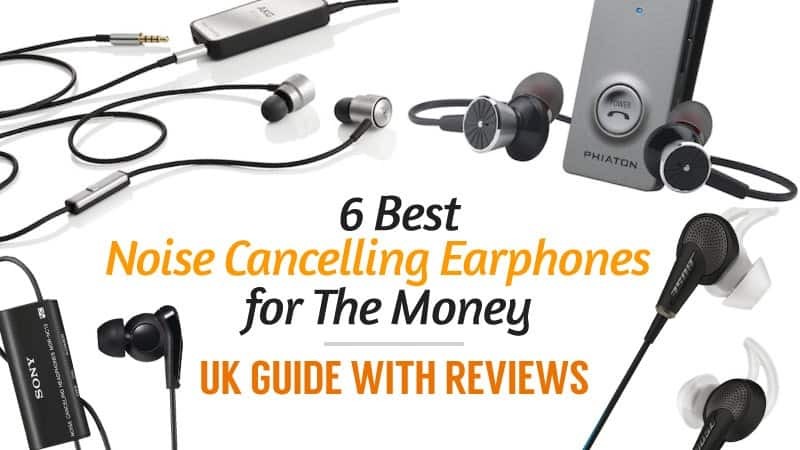 From those that serve the most basic purposes with good quality of sound, to ones that have the latest Bluetooth technology, every earphone here has one thing in common – they all provide outstanding noise cancelling features. So if you are looking for a more intimate listening experience, or need concentration while taking a call – one of these is going to be perfect for you. What did you think of our noise cancelling earphone selection? Are there any you would have changed or suggested? Leave a message in the comments, we would love to hear from you!